As an attorney who serves the Statesville, NC area, I practice several different areas of law. Understanding the law and the legal implications of certain actions can be confusing and in many cases, overwhelming. If you recently received a DWI, are interested in divorcing your spouse, or realize that it’s time to begin estate planning and you need an attorney to help, turn to me, W. Sloan Goforth, Attorney at Law. As an attorney who serves the Statesville, North Carolina area, I practice several different areas of law. These include criminal law, family law, traffic law, disability law, personal injury law, and estate law. Regardless of what legal service you are in need of, you can rest assured that I will provide you with committed guidance and do everything I can to protect your best interests. My experience as an attorney did not begin right after I graduated from Appalachian State University. Rather, I worked as a high school teacher before pursuing my law degree. I value the time I spent as a teacher because it allowed me to learn skills that benefit my clients during consultations and in the court room. At all times throughout the development of your case, I will make sure you remain fully informed, so you know exactly where things are heading. Doing this is just one of the many ways I will illustrate to you that I truly care about earning your confidence. The next time you need an attorney, please contact me to find out more about how I can assist you and to set up your free consultation at my office. 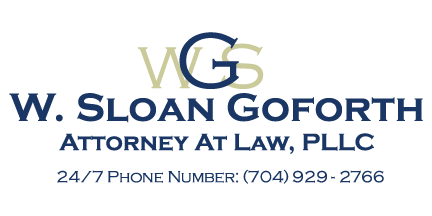 At the office of W. Sloan Goforth, Attorney at Law, our attorney proudly serves residents of Statesville, Troutman, Taylorsville, Mocksville, Mooresville, Hickory, Iredell County, Alexander County, and Davie County, North Carolina.